This is a German Hop and is used as a dual purpose hope as it gives excellent Bittering properties and a pleasant aroma. It is mainly grown in the Hallertau region, with some also grown in Belgium and Spain. Its typical alpha acid levels are 8.0-10.0% depending on the harvest, so you may need to adjust the amounts used in your recipe to ensure that you match the target EBU value. 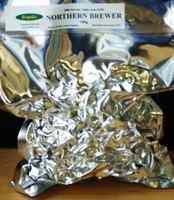 It is widely used in Dave Line's recipes, especially those for Greene King clones, (including his recipe for Abbot Ale), Courage Best, Mackeson and Younger's Tartan Keg.